Lush gardens are the first thing that enter your mind, as you walk into this beautiful Oasis in centro. 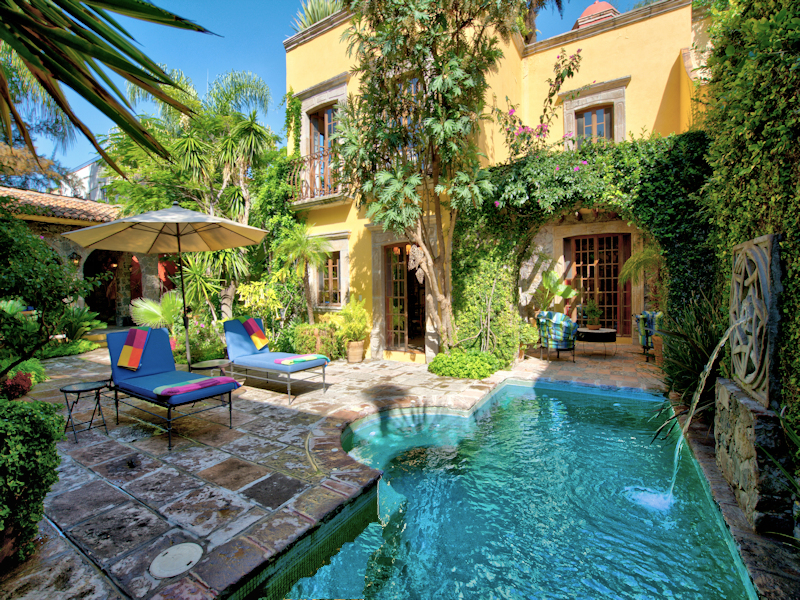 Casa Allende is a 3 bedroom house which is a 3 minute walk to the Instituto de Allende. You are minutes from restaurants and boutique stores. The main living space of the house has 2 living area levels and the third level is the beautiful roof top terrace. There is a guest house with another master suite, and a separate outdoor living room with fireplace. The main house, as you enter you have the kitchen on the right with the living room straight ahead. 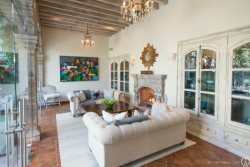 The living room has French doors that open to a sitting area that look to the pool. The dining room is off the living room and it seats 8. You can also access the kitchen through a hallway off the dining room, and there is also a half bath between the dining room and kitchen. The dining room has French doors that open to the outdoor terrace and the garden. The second level has 2 bedrooms both look out into the courtyard and pool area with Juliette balconies. The first bedroom has twins beds, and than Master suite has a King bed. Both bedrooms have ensuite bathrooms. There is also an office on this floor with a full bathroom. The third level you have an outdoor seating area where you can also dine and enjoy the views. The guest house or "casita", as it's called in Spanish, is in a separate building - it has it's own sitting area, Queen bed, TV, ensuite bathroom, large walk-in closet. The covered outdoor living room has a large sectional sofa, outdoor fireplace, bar area and sound system. There are stairs off the outdoor living room that lead to a rooftop sunning area with loungers, as well as a gas grill. You are surrounded by lush gardens 2 outdoor dining areas one in the garden by the outdoor living room, and one of the rooftop terrace, where there are views of the Parroquia. There is a maid, who can cook simple breakfasts. Here schedule is Monday - Friday 9-3 and Saturday 9-12. Food is not included in the rental rate. We do have pre-arrival grocery stocking services for a fee.